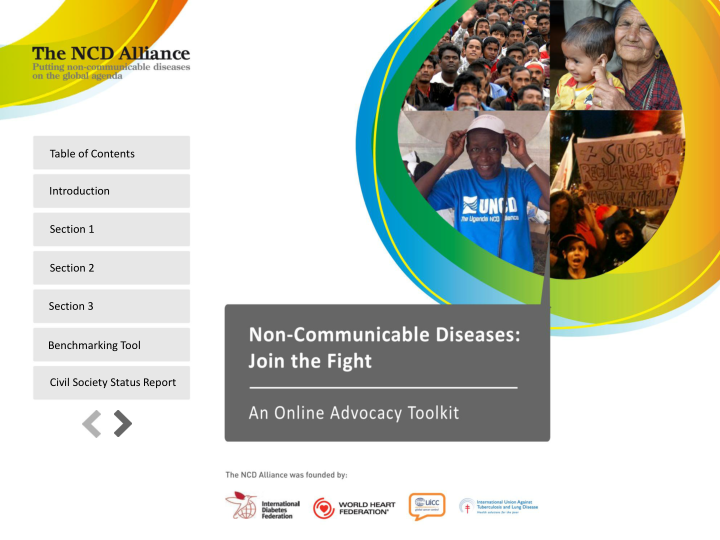 The Non-communicable Disease (NCD) Alliance is a civil society network uniting 2,000 federation associations, civil society organisations, scientific and professional associations, academic and research institutions to improve NCD prevention and control worldwide. The NCD Alliance works to drive the NCD agenda forward, as a thought leader on policy and practice, a convener of civil society movement, a partner to governments and an advocate for people at risk of or living with NCDs. UICC is a founding member of the NCD Alliance and we continue to see the integration of NCDs as a priority in global, regional and national health and development planning and implementation. UICC will continue to support the capacity and sustainability of national and regional civil society alliances and networks in low- and middle-income countries to effectively influence cancer and other NCD prevention and control efforts at the national level. In 2015, the NCD Alliance facilitated the first Global NCD Alliance Forum in Sharjah. This Forum provided a platform for knowledge exchange, capacity building and priority setting, and resulted in the formation of new international alliances and the adoption of the Sharjah Declaration, a global expression of civil society’s commitment to engage in advocacy and accountability to advance the NCD response. The next Global Forum is scheduled to take place in Sharjah, UAE from 9-11 December 2017, co-hosted by the NCD Alliance and Friends of Cancer Patients.